Confession time: I used The Code. Is it so surprising? 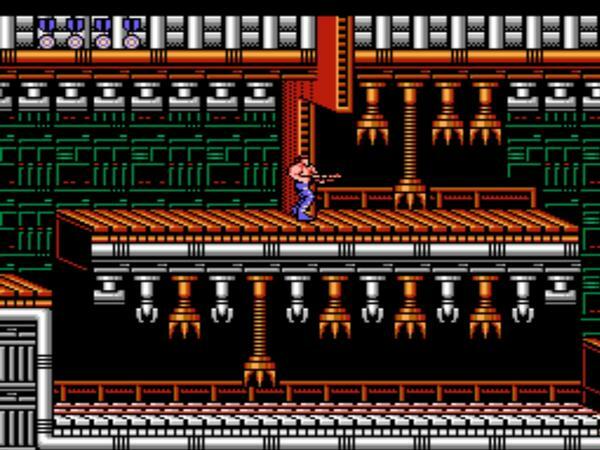 The Code is carved into the very heart of Contra. Contra is the reason that most of us know The Code. 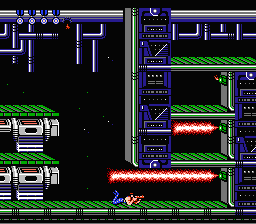 If it weren’t for The Code, thousands of children would have never seen Contra‘s later levels. Even as an adult gamer with some skill and a fair amount of retro cred, I can’t make it halfway through the game without The Code. I wanted to really feel like I understood the game before I tried to comment on it, and I didn’t feel like I could do that properly without seeing it through to the end. Hence: The Code. 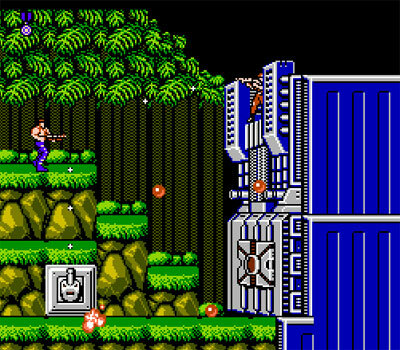 Contra is such a fascinating dichotomy: brutal, unforgiving, and unbelievably fast-paced; it is a game that chews up players and spits out their tiny pixelated bodies. And yet: The Code. Contra starts you out with three lives, and you’re allowed two continues. That gives you a grand total of nine–count ’em, nine–like a cat. Good luck making it past level three! You’ll need it. It’s not an 8-bit sidescroller without some Spike Crushers. Of course, all it takes is a little up up down down left right left right B A select start and you’ve got yourself a nice deal with the metaphorical devil: Thirty lives! Thirty lives per continue! For those playing along at home, that’s ninety lives. That’s ten cats. Ninety lives gives you plenty of wiggle room to beat the game. On my first try, without having seen levels five through eight before, I cleared it in somewhere around sixty-seven deaths. It’s still fun, and it still takes a certain modicum of skill and reflexes, but deep down inside you know you’ve used The Code and there are no bragging rights to go along with your accomplishment. You are a Contra Tourist. Difficulty levels in games have always fascinated me, because when considering the choice of which difficulty to select you necessarily have to ask yourself what you want to get out of the game experience, like an actor calling offstage to the director: “What’s my motivation?” Are you playing primarily for the narrative? For the joy of exploration? Or are you playing for the challenge itself–for the sense of accomplishment that comes from having triumphed over a system that’s trying to kill you? Speaking from personal experience, I almost always play games on “Normal.” Why? What’s my motivation? Well, when I ask myself what I want out of a game, I ultimately have to admit that a lot of the reason I’m playing is to have a dialogue about the experience with other players. When I talk to other gamers about having played the game, I want to make sure that my experience is in line with theirs–and I assume that most players select “Normal” because this is often the default setting. Very frequently, if I take a second trip through a game, I’ll crank the difficulty up to “Hard” in order to give myself an added challenge. Nevertheless, this decision has implications. 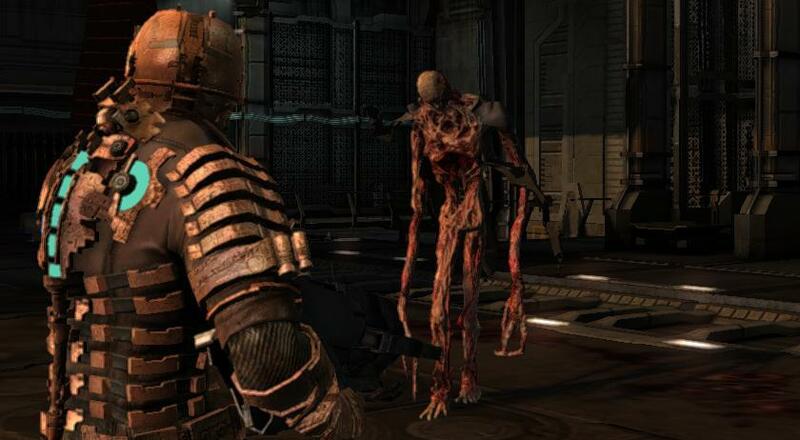 I’ll be honest and admit that I wasn’t all that frightened by the original Dead Space on account of playing it on Normal. (It’s still a super great game! I had fun!) I simply didn’t feel in real danger enough to be frightened (brilliant sound design and direction notwithstanding). I still enjoyed the narrative a great deal, and the exploration–it’s a very atmospheric game–and blasting Necromorphs was a hoot even if they didn’t kill me very often. I was frankly a little bored during my first playthrough of Kingdom Hearts II because it was simply too easy on Normal. I was mostly in it for the story (yes yes, enjoy your laughs at my expense here), but the game does have a very compelling combat system that’s a great deal of fun to play–if it’s challenging enough for you. If I’m playing the guitar in Rock Band, I get bored if it’s a difficulty lower than Expert–if I’m playing drums, I’ll fail out almost immediately if it’s on Hard. All of these choices of difficulty can legitimately affect the quality of the entertainment I’m experiencing (and the character of the entertainment as well, in the case of Dead Space). Which brings me back to Contra. How does the enormous difficulty gap affect this game? More importantly, is this a game you should go back and play? But in an environment with such a yawning gulf of stark contrast, there must necessarily emerge player-driven objectives and self-challenges. “Well,” perhaps you’ll say, “I’ll use The Code, but if I bring my buddy along for the ride we’ll see if we can beat the whole thing without having to continue.” “Let’s see who can get the furthest on the nine lives we’re given.” “Whoever dies first buys the beer.” That sort of thing. Could we call them “emergent objectives?” Why not? Who’s to stop us? The common wisdom is that 8-bit games are monstrously difficult, and this truism isn’t entirely off-base. But through avenues like the Konami Code, they are more diverse than they are often given credit for. Contra is made easier by means of The Code, but it’s not at all cheapened. Rather, it’s made more interesting–the player is given more perspectives from which they can evaluate it. It’s for this reason that I think it’s worth going back and replaying. Well, this, and because shooting everything with a million bullets is somehow fundamentally satisfying. Surely that has something to do with it. I’m firmly of the opinion that using The Code IS part of the game. It’s a metagame challenge. Nobody fights Psycho Mantis without switching controllers (sorry, people on emulators) – and nobody beats Contra sans code. I find that nowadays, “Normal” difficulty is intended for folks who play games very casually and aren’t looking for any difficulty at all. That’s not ALWAYS the case though. It makes gauging a game hard – you have to guess what difficulty level is meant for you. Its good that a lot of games permit modification of difficulty mid-game. Also, spreadshot – am I right! The notion that the Konami Code would be an essential part of the experience, like looking up Meryl’s frequency on the back of the CD case in Metal Gear Solid, is profoundly interesting to me– because how do we learn the Code? How is that knowledge imparted to us? In some way, I almost feel like that implies that in order to bear witness to the entirety of Contra, one has to be a member of gaming culture– like knowing the right password to get into a speakeasy.